Interview with Solange Bolembe from RIAO-RDC, an information and support network for community organisations in the Democratic Republic of Congo (DRC), about the many challenges that women face who live in communities affected by vast oil palm plantations managed by Feronia-PHC, a company financed by several European development banks. This interview with Solange Bolembe from RIAO-RDC, an information and support network for community organisations in the Democratic Republic of Congo (DRC), highlights many challenges that women face who live in communities affected by vast oil palm plantations. The industrial plantations are managed by Feronia-PHC, a company financed by several European development banks. The interview is prefaced by an overview of the company’s history in the plantation areas and the role of key investors that have ignored the many conflicts and abuses reported by villagers in the region. In 2008, the global food corporation Unilever sold “Plantations et Huileries du Congo” (PHC), a set of three industrial oil palm plantations covering more than 100,000 hectares of land in the Democratic Republic of Congo (DRC), to a little-known company called Feronia Inc. Feronia is listed on the Stock Exchange in Toronto, Canada, and had no experience in agriculture when it took over the oil palm concessions previously held by Unilever for almost 100 years. The sale raised 14 million US dollars in cash for Unilever; in addition, the company left behind around 10 million US dollars in liabilities to the new owners. (1) Financially, Feronia has posted losses every year since it bought PHC. Yet, Feronia attracted development agencies’ interest soon after the company acquired the licenses. Government-backed ‘development’ banks and investment funds from Britain, France and Spain provided loans that later turned into shares when Feronia could not repay them. This resulted in the UK’s development corporation CDC owning more than 60 percent of Feronia in 2016; the percentage dropped to around 30 percent in 2017 when a new investor, registered in Mauritius, injected new cash into the company. The initial development agency funds of about 35 million US dollars rescued Feronia from collapse. By 2018, Feronia-PHC had received at least 118 million US dollars, including 49 million in loans approved by German, Belgian and Dutch development banks in 2015. They approved the loans despite NGO reports and statements from community leaders in all three plantation areas who had drawn their attention to the illegitimate and possibly illegal nature of the concession contracts as well as the appalling working conditions for labourers on the plantations and the many broken promises to communities affected by the plantation concessions. In addition to broken promises, communities have on several occasions informed the development banks financing Feronia-PHC that in their view, the land title and concession documents held by Feronia are illegitimate, and possibly illegal. They point not only to the violent theft of their land during colonial times but also to a long list of procedural mistakes, omissions and dubious procedures such as the fragmenting of the original concessions into small plots of less than 200 hectares in recent years. Issuing such contracts for small areas of land requires a far less onerous procedure than for the issuance or renewal of the large concession areas that Feronia bought from Unilever. But even these hundreds of concession contracts for less than 200 hectares that date back to 2015 / 2016, seem to contain significant procedural mistakes. 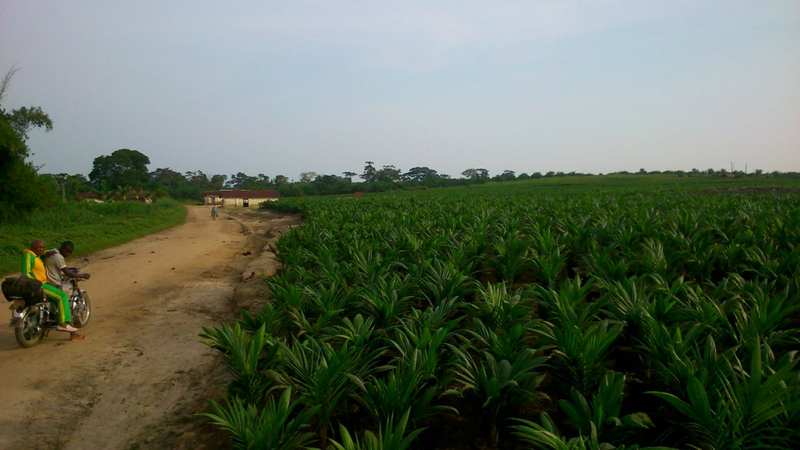 How does the presence of Feronia-PHC affect women living at Lokutu, Boteka and Yalingimba, the three locations where the company’s industrial oil palm concession occupy more than 100,000 hectares of land? Life for women is very hard. At least, when the plantations were still owned by Unilever, there were schools and hospitals. After Unilever left, the company that took on the plantations did not maintain support for the schools and hospitals, which are accessible for free only for the few employees of the company. That has had a big impact on communities, and women in particular; the new company has brought poverty back to the villages. Most children do no longer go to school; malnutrition is very high; many children die before they reach the age of five because their families no longer have access to health centres; diarrhea is common in the villages because people have lost access to safe drinking water, children die of typhoid. Women are also left without land to cultivate, and most cannot find work on the plantations. The few women who do work at the company, for example in the nursery, must fulfil extremely high quotas to receive their full pay. At the nurseries, women have to prepare 600 pots (plantines) a day; if they prepare less than that, their pay is reduced. 600 pots means putting sand into a small bag 600 times, placing a seed in 600 bags, and aligning 600 bags in neat rows. How does it affect the daily lives of women in the villages? It’s like living on alert all the time. The majority of women in rural areas across Africa live from family agriculture, from fishing, from collecting snails, caterpillars and mushrooms from the forests. But inside the concession, women are not allowed to carry out any of these activities anymore; even walking inside the plantations, or the vast areas of forests that the company also claims to be part of its concessions, has become very difficult for women. That makes life very complicated for women living inside the vast concession areas. It also cuts off their access to medicinal plants, which is particularly serious because most families have no access to health centers or hospitals. Some medicinal plants have also disappeared when the forest was turned into plantations over the decades. One time, the company handed out some peanut and maize seedlings in some of the villages. Women went to plant the seedlings in the forest that is not so far from some of the villages, but is inside the concession claimed by Feronia. (6) At harvest time, security guards demanded that the women not replant peanuts and maize again because these forests also belonged to the company, and cultivation was not authorized. Worse for women is that the company prohibits anyone living inside the plantations from picking up even a few palm nuts for their own use. If women collect some of the palm nuts that have been left on the ground after harvesting, and a company security guards find them with these nuts, they risk being beaten and thrown into jail. (7) Even if someone brings in nuts from outside the concession area, the same thing happens: Company guards will claim that the palm nuts were stolen from the company plantations, and people find themselves beaten up and in jail. The only palm oil that villagers inside the plantations are allowed to use is the palm oil produced and sold by Feronia-PHC, even though traditional production of palm oil is what these families have lived off long before oil palm companies came and took their land. If women no longer have access to land to cultivate or forests to collect snails, mushrooms, medicinal plants and palm nuts, how do they feed their families? That is very difficult! At Lokutu, for example, women have to walk a long distance to find a place where they can fish. From Boteka as well as Lokutu, women travel to Mbandaka [a city along the Congo river, accessible by boat from both locations] to buy various items, from salt to soap, that they then sell for a slightly higher price in their villages or the market towns closer to where they live. From the little money they make that way, they then buy staple foods. Others buy food items at Mbandaka and sell them in the villages, because those living in villages inside the plantations have no access to land to grow their own food. Beans for example. Most of the beans consumed in the villages affected by the plantations come from as far away as Kinshasa! Village women forced to buy beans brought in from the city, imagine! Because local food production has been made impossible by the plantations. What would change the situation women live today for the better? Women are getting ready to reclaim their land, to cultivate as their grandmothers did before the company arrived and took away their land. They want to grow food again, they want to be able to fish again in the streams and rivers near their villages. They want to go back to producing palm oil themselves, like their grandmothers did. And not just palm oil. Oil palms provide many other products that women used to prepare. Producing palm oil is an ancient tradition for women in this part of the world. They want to be able to make a living where they live, not be forced to leave their villages to buy things outside and resell them in their villages because that is the only meagre income they can generate. They want to work in their villages, cultivate their fields and palm groves, collect their traditional food in the forest. RIAO’s role is to connect communities at the three locations, and also to support women so they are aware of their rights. Today, women in Boteka or Yalingimba have no possibility to find out what is happening at Lokutu and vice-versa. That makes solidarity among the villages difficult. This must change so women can unite and speak with one voice. Setting up community radio and making women aware of their rights are crucial steps on the way to women reclaiming their communities’ ancestral land and starting to cultivate their own food, producing their own palm oil again like their grandmothers did. (1) RIAO-RDC, GRAIN et al. (2016): Land conflicts and shady finances plague DR Congo palm oil company backed by development funds. (5) The company and the development Banks who finance Feronia-PHC have claimed that this practise going back to colonial times, called ‘Marsavco package’ [colis Marsavco’], named after the Unilever company that produced soap and palm oil from the oil produced at the plantations, has been stopped and that villagers are now paid their wages in cash, and only those who choose to receive palm oil and soap instead of money can receive a portion of their wages in goods. (6) Feronia-PHC uses only ca. 25,000 hectare of the over 100,000 hectares as oil palm plantation; over 70,000 hectares remain forested but villagers are not allowed to enter the forest area either. – WRM Bulletin 208 (2014): DRC: handing lands for industrial oil palm plantations, REDD and foreign investors. – WRM Bulletin 233 (2017): FERONIA in the Democratic Republic of the Congo: Harassment, violence and oppression .